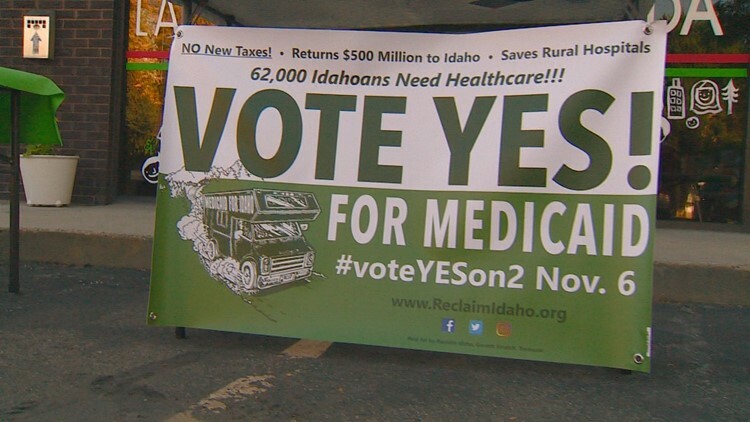 A campaign sign encourages Idahoans to vote yes on Prop 2, which would expand Medicaid in the state. The approval of Proposition 2 means lawmakers must now enact laws to expand Medicaid coverage to those in the so-called healthcare gap. BOISE — Idaho voters have approved a ballot initiative that will expand Medicaid coverage to roughly 62,000 Idaho residents who can't afford health insurance on the state exchange. The vote means lawmakers must now enact laws to expand Medicaid coverage to adults who currently earn too much qualify but don't earn enough to get subsidized health insurance coverage on the state health insurance exchange. VERIFY: What happens if Idaho's propositions pass? Lawmakers have repeatedly shot down legislative efforts to expand Medicaid coverage, and that prompted the citizen ballot initiative effort. Proponents say expanding Medicaid coverage will bring federal tax dollars home to Idaho and reduce state health costs by reducing the cost of indigent care currently borne by local governments and health care facilities. But opponents claimed the expansion would be bad for the state and pull money from other needs like education or infrastructure.